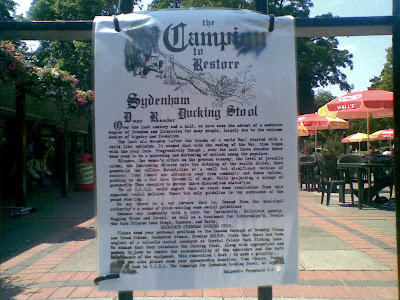 While taking my mum for lunch in Crystal Palace Park yesterday, I was startled to see a notice pinned to the cafe gate calling for the restoration of the Sydenham Ducking Stool. The notice - which was anonymous and without any contact details - not only wanted this restored for history, but because it could be brought back into use as an effective means of punishing anti-social behaviour. Seeing as ducking stools were pretty much only used for punishing women - in particular those accused of witchcraft - I would have to say I am extremely opposed to this idea! I intend to find out more about this barbaric scheme and, when I do, I will let you know on A Bad Witch's Blog. I'm hoping it's someone's idea of a joke. Excellent - love this. Ducking some of Bromley's pro-privatisation Tory councillors. Duck 'em all.